A freshman from Douglasville, Georgia, Andrea Smith of Berry College (on right, with Head Coach Margaret Knight) won team novice western on May 6th to pull the Vikings into a tie for first with the University of Findlay at the time. LEXINGTON, KY - Between the fall of 1978 and May of 2010 the IHSA awarded National Champion western team honors to 36 teams. On four occasions there was a tie at IHSA Nationals for the high point western team, and since team ties at Nationals are not broken the title was shared in 1990, 1994, 2002 and 2003. During that time exactly half the titles were awarded to schools located in the state of Ohio. Miami University of Ohio won three of the first four western titles in the early days of IHSA western competition, while Otterbein College (now Otterbein University) was high point western team at 1988 IHSA Nationals. However since 1991 two other Ohio schools have dominated the year-end IHSA championships, earning 14 titles and six straight heading into the 2011 showdown at Alltech Arena at the Kentucky Horse Park. The Ohio State University captured nine titles (eight outright) between 1991 and 2008 while the University of Findlay won the title five times since 2001 including 2009 and 2010. Considering the fact that both Ohio State and Findlay won their semifinals shows for the fifth season in a row less than seven weeks prior to 2011 Nationals each would be among the favorites to add another championship to their ranks. Seven other schools had also advanced a full western team to 2011 IHSA Nationals. Black Hawk College, which held the early lead at 2009 Nationals before falling to Findlay, won the Springfield, Missouri semifinal. Murray State University, the National Champion team in both 1981 and 1985, had finished four points behind Black Hawk at the Springfield semifinal to claim reserve high point team honors. Utah State University won a close race for second at the Findlay, Ohio Semifinal. The Aggies finished a point ahead of Morrisville State College and three points ahead of Cal Poly - San Luis Obispo. Jason Romney, who won the individual AQHA Trophy at 2010 IHSA Nationals, earned 12 of a possible 14 points at the Findlay semi to help get the Aggies to Lexington. Berry College was also a reserve champion at Semifinals. The Vikings were seven points behind Ohio State and three points ahead of Oregon State at the Canyon, Texas Semifinal. Oregon State advanced, narrowly edging out S.U.N.Y. - Oswego 20-19 for third place. The University of Nebraska at Lincoln was the lucky third survivor in Springfield, edging out Alfred University by a point 19-18 after no less than five teams were still alive for third place going into the final team class. While Ohio State, Findlay, Oregon State, Berry and Nebraska at Lincoln had each advanced a full western team to 2010 Nationals Utah State, Morrisville State, Black Hawk and Murray State were each back at Nationals after at least one full season away from the Nationals western team competition. In Murray State's case it was the first time this century that the Racers had a full team of any kind at the National show. Seen here with assistant coach Jake Bowman, Andrew Wolf (on left) gave the University of Findlay the early lead with a first in team open reining. The senior from Schwenksville, Pennsylvania won the exact same class at 2010 IHSA Nationals. As has been the case at every four-day IHSA National show save for the 2008 event the first day was comprised entirely of hunter seat classes. Once these classes had been completed (by 5:00PM as it turned out) the Alltech Arena was available for the schooling of western horses. Though most of the western horses had been schooled outdoors since 1:00PM, the reining horses were put on display in the arena for anyone who wanted to observe. Seeing as the schools are less than six hours away both Ohio State and Findlay had horses in the competition, which would appear to help both in their quest for another championship. The western portion of 2011 IHSA Nationals started at 1:24PM on May 6th, when Kelsey Horner of the University of Nebraska at Lincoln entered the ring to start the Team Open Reining division. A senior from Kearney, Nebraska, Horner received a combined score of '140' from judges Holly Hover and Chris Kozlowski. As the class continued, the vast majority of the riders scored in the 140's, which was not the case during other reining classes held during 2011 Nationals (the alumni reining, made up of only seven riders due to scratches, saw no one score above 138.5). Because announcer Kenn Marash announced every score, anyone with a pen and paper could write down the scores and figure out how the ribbons would turn out. After everyone in the division had reined each of the nine riders was invited back to the arena for the awarding of ribbons. Ninth place went to Samantha Eckert, a Murray State junior from Indianapolis, Indiana who would compete two more times during 2011 Nationals. Eckert's score was '136.' 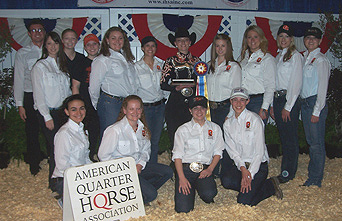 Eighth place went to Catherine Howland, a Morrisville State College junior from Rutland, Vermont who would improve on her score of '138.5' during her appearance in the individual AQHA Trophy division. Horner was seventh while Katelyn Lewis of Oregon State was the first rider to earn a point for a western team in 2011. A sophomore from Amity, Oregon, Lewis received a score of '141' in her only ride at 2011 IHSA Nationals. Fifth place went to Austin Griffith of Ohio State University. The Buckeye freshman from Dublin, Ohio received a score of '141.5.' The son of Ohio State coaches Ollie and Debbie Griffith, Austin Griffith would ride in every single western open division held during the 2011 Nationals event. Fourth place went to Romney. A senior from Farmington, Utah, Romney received a score of '142.5.' Like Griffith, Romney would also compete in every possible western open division (two team classes, two individual classes and the individual AQHA Trophy division). Rebekah Irish, a Black Hawk College sophomore who goes simply by 'Bekah' was third with a score of '143.5.' From Acampo, California, Irish would ride against Griffith and Romney in all the western open divisions and would outscore both of them in every matchup. Reserve champion honors in the division went to Allie Jones of Berry College. Riding in her fourth IHSA Nationals event, Jones first ride of the long weekend received a judge's score of '145.' Jones was one of two riders to have shown in the same division a year earlier, having earned a fourth in 2010. With everyone else now having left the ring with their ribbons, only Andrew Wolf remained. The Findlay senior from Schwenksville, Pennsylvania received a score of '146' to win the class. Wolf was the other holdover from the 2010 team open reining, having won it at that time with a score of only '144.' With Wolf claiming the blue ribbon the Findlay Oilers found themselves in familiar territory. Winners of the top team prize four of the past six seasons, Findlay held the early lead. Not since the middle of 2009 Nationals had the Oilers trailed anyone in the IHSA Nationals western team competition. Would they lead throughout 2011 Nationals like they had done last season? Four hours later the Team Novice Western division would be the second of six western team classes and the final class of any kind held on day two of 2011 Nationals. Each rider entered the ring before jogging and loping. Then one by one each of the nine riders performed the novice pattern around a set of cones. After 40 minutes everyone had completed the pattern and was instructed to line up for the presentation of ribbons (Unlike the reining classes, no scores were read aloud for the rail divisions. Everyone learned where they placed when Marash announced the results). Ninth place went to Christine Towne of Morrisville State College while eighth went to Courtney Noonan of Ohio State. 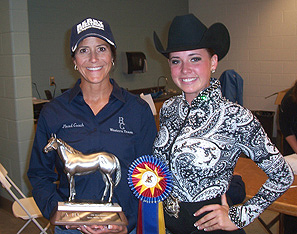 A senior from Willoughby, Ohio Noonan won team intermediate western at 2009 Nationals and would place fifth in individual intermediate western at 2011 Nationals two days later. Utah State junior Dianne Blocker was seventh while Marilyn Brandt of Black Hawk was sixth. Hayley McGuire, a senior from Wilsonville, Oregon was fifth for Oregon State. McGuire was one of only three riders who could claim to have competed in team classes at 2008, 2009, 2010 and 2011 IHSA Nationals (McGuire showed in at least one team western class at all four National shows while also riding in several individual western classes over that span and an individual hunter seat class in 2009). Loren Witt, a sophomore from Napierville, Illinois was fourth, giving Murray State their first western team points at an IHSA National show since the early 1990's. Dustin Renken, a freshman from Bertrand, Nebraska was third to put the Cornhuskers on the scoreboard. Makena Lawrence, a freshman from Santa Fe, New Mexico added five points to the Findlay total with a second. For the first time in two years the Findlay western team had to share first place. Andrea Smith, a freshman from Douglasville, Georgia won team novice western for Berry College. At 6:11PM the second day of Nationals was competed, with Berry having surprised many by pulling into a 12-12 tie with Findlay through a third of the western team competition. The rest of the scoreboard showed Black Hawk with 5, Nebraska at Lincoln with 4, Murray State, Oregon State and Utah State with 3 each, Ohio State with 2 and Morrisville State looking to earn their first team points since 2007 Nationals in West Springfield, Massachusetts. Corey Hayes had placed fifth in team intermediate western for the most recent Mustang points, exactly five years ago on this day. She had previously competed in at least five other classes at IHSA Nationals since 2008 without earning a blue ribbon. From Sandy, Oregon, senior Kaci Sintek (center) poses with her Oregon State teammates after winning in her final IHSA undergraduate ride. Sintek's win in team advanced western horsemanship put the Beavers within striking distance of front-runner Berry. Because of a few modifications to the IHSA Nationals show schedule since last years' event the only western team class on Saturday, May 7 was Team Beginner Western Horsemanship. The eighth of nine classes held on this day (which also included all the hunter seat award presentations, the Lifetime Achievement Award presentation and the Parade of Teams), the arena was sadly not as busy by the time the nine participants took to the ring after 5:00PM. Save for the fact that this group of riders was not asked to lope the routine was the same as for the novice western class held the previous afternoon. Eventually everyone completed their pattern and the awards were presented. Ninth place went to Elijah "Eli" Darnall, a University of Findlay senior coincidentally from the town of Findlay, Ohio. Though this was his only IHSA Nationals ride Darnall would make another appearance in the ring a short time later. Eighth place went to Jordan Hayes of Murray State while seventh place went to Lisa Yamane of Utah State. Brizett Cole added another point to the Nebraska - Lincoln total with a sixth while Caitlin Sanders equaled Buckeye teammate Griffith with a fifth. A sophomore from Warren, Ohio, Sanders had won the division at 2010 Nationals. Shelby Zerrusen added three points to the Black Hawk total with a fourth. It took five years and a day but Morrisville State College was back on the board. Mustang sophomore Kelly Hunter was third to put Morrisville in a tie with Ohio State up to this point. Amy Cherry, a junior from Chatham, New Hampshire who had placed out of the ribbons a day earlier in individual walk-trot (making her one of roughly five riders to show both western and english over the long weekend), was second for Berry to put the Vikings into first place. However Oregon State made a bid to remain in contention as Kathryn Sargent won the class for the Beavers. A senior from Portland, Oregon, Sargent raised the Oregon State team total to 10 points, only two behind Findlay and seven behind the eyebrow-raising Vikings. Moments after all the photos of Sargent had been taken, Darnall brought former Findlay teammate Kelly Harmon into the ring (the ring would need to be dragged prior to alumni reining, so there was a moment of opportunity). Though Harmon was sixth in individual intermediate western at 2008 Nationals in Burbank and fourth in individual novice western at 2009 Nationals in Murfreesboro her most memorable appearance at an IHSA National show will likely be this one. Two years after graduating, boyfriend Darnall got down on one knee, presented Harmon with a ring and asked her to marry him. According to IHSA Founder and Executive Director Bob Cacchione this is the first time he knows of that there has been a marriage proposal at an IHSA National show. Not only did Harmon say 'Yes' both she and Darnall re-enacted the scene in the winner's circle area a few moments later for anyone who may have missed it the first time around. Through half the team classes it was Berry 17, Findlay 12, Oregon State 10, Black Hawk 8, Nebraska - Lincoln 5, Morrisville State 4, Ohio State 4, Murray State 3 and Utah State 3. Though the scoring thus far did not favor Ohio State the Buckeyes historically always come back. Though Findlay was behind for the first time since they overtook Black Hawk at the '09 event one would be uncomfortable betting against a team that finished no worse than second at each of the past four National shows. You could not count the usual front-runners out, but if the Ohio schools did not rally it would be the biggest story since Eli Darnall proposed to Kelly Harmon in the ring at Alltech Arena! 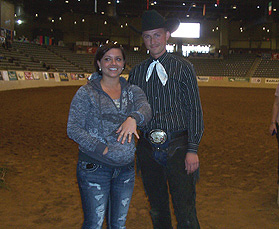 2009 Findlay graduate Kelly Harmon (on left) shows off the ring former teammate/now fiancee Eli Darnall (on right) gave her moments earlier in the ring at Alltech Arena. IHSA Founder and Executive Director Bob Cacchione (not pictured) said this is the first engagement to take place at an IHSA National show that he knows of. The final day of IHSA Nationals (Sunday, May 8th) kicked off with the fourth team class, the Team Advanced Western Horsemanship division. Begun at 8:12AM (when the first rider entered the ring at a walk), the division - patterns and all - was completed and placed by 9:00AM. David Worley, a Murray State senior from Corbin, Kentucky was ninth to start the countback. For the first time since 2006 there was a western team class in which neither a Findlay rider nor a Ohio State rider made the top six (and this statistic should be taken with a grain of salt as Findlay did not have a full western team at 2006 IHSA Nationals in Harrisburg). Madison Hallas, a sophomore from West Nyack, New York was eighth for the Oilers while Claire Sutton, a sophomore from Perrysburg, Ohio was seventh for the Buckeyes. Though most did not have time to analyze the situation, it was clear that several schools could gain on defending champion Findlay. The question was where would Berry place? Roxanne Clemens, from Vermont, Illinois who is in her third year at Black Hawk College, was sixth to raise their total to nine points. Margaret Roberts, a Morrisville State sophomore from Weedsport, New York was fifth to elevate the Mustangs to six points. Nebraska added three points to reach eight overall, as freshman Katrina Quick was fourth. From Hordeville, Nebraska, Quick would later place third in individual novice western horsemanship. Third place went to Kristen Atwell of Berry College. Not sure if she is technically a junior or a senior (though she will be back with the Vikings in 2011-12), Atwell's four points assured Berry they would not only lead through the fifth team class but that Findlay would need at least 9 points over the final two team classes just to tie them. From Cartersville, Georgia Atwell moved Berry's current total to 21. Lauren Doyle, a junior from Logan, Utah earned the Aggie's best ribbon of the show so far, placing second to give Utah State eight points and a shot at the reserve championship if everything broke correctly. Like her teammate Hayley McGuire, Kaci Sintek of Oregon State had competed in at least one western team class as a freshman, sophomore, junior and now senior. The Sandy, Oregon product had never won a team class (and had placed sixth in team advanced western in Lexington last May) but in her final undergraduate ride Sintek came through with the champion ribbon. The Beavers were suddenly in second place, only four points behind Berry. Even without any points in back-to-back team classes Findlay was only nine out. Berry 21, Oregon State 17, Findlay 12, Black Hawk 9, Nebraska - Lincoln 8, Utah State 8, Morrisville State 6, Ohio State 4 and Murray State 3. Following the the first half of the individual AQHA Trophy division's reining phase it was time for the penultimate team class, the Team Intermediate Western Horsemanship. Six teams were mathematically alive going into the intermediate, and when it was completed only two had hope of being 2011 National Champions. Ninth place went to Hannah Scow of the University of Nebraska at Lincoln while eighth place went to Kelly Black of the University of Findlay. At this point it was a certainty that a team with no prior IHSA National Championship would leave Lexington with the title. Sophia Browning of Ohio State was seventh, meaning the Buckeyes and Oilers had repeated their placings from team advanced western a few hours earlier. It was more shocking to this writer that the two legendary Ohio programs could miss out on earning points in consecutive team classes than a school from outside of Ohio would win the western team competition! Tanya Ashford, a Morrisville State freshman from Wapwallpenn, Pennsylvania was sixth to bring the Mustang's total to seven points. Audrey Raby, a junior from Wallsburg, Utah was fifth to raise Utah State's total to 10. Andrea East, a junior from Lancaster, Kentucky doubled Murray State's team total from three points to six with a fourth. For the moment Murray State had overtaken Ohio State for eighth place. Katharine Du Mont, an Oregon State sophomore from Portland, Oregon was third. Ariel Robelen, a Berry College sophomore from Fort Lauderdale, Florida was the reserve champion. Paige Frevert, a Black Hawk sophomore from Glassford, Illinois won the class. Frevert would go undefeated for the day, later winning individual beginner western horsemanship. Though Frevert raised Black Hawk's total to 16 points it would not be enough to keep her team in the race for first. Robelen had assured Berry of at least second place, giving the Vikings a 26-21 lead over Oregon State headed into the final team class. Black Hawk was still alive for second should Oregon State falter. Oregon State needed Berry to falter for a shot at the championship. Already assured of finishing no higher than third (though they were still within reach of catching Black Hawk overall), Findlay Head Coach Cindy Morehead commented that "this is good for the IHSA that someone (other than Findlay or Ohio State) will win for a change." With five of six classes in the books it was Berry 26, Oregon State 21, Black Hawk 16, Findlay 12, Utah State 10, Nebraska 8, Morrisville State 7, Murray State 6 and Ohio State 4. Between sophomore Paige Frevert (on horse) and teammate Bekah Irish (not pictured) Black Hawk College earned five blue ribbons over the course of three days. However Frevert's first in team intermediate western horsemanship was Black Hawks' only blue ribbon during the team competition. Riders from Oregon State, Findlay, Black Hawk and Ohio State won individual classes over the next four hours, while Irish won the individual AQHA Trophy. Prior to the final team class Irish had drawn comparisons to Jake Bowman (now a coach at his alma matter, Bowman dominated 2005 Nationals in his senior year at Findlay) and Quincy Cahill (a 2002 Texas A & M graduate, Cahill dominated multiple IHSA Nationals. Cahill is the only western rider to win the individual AQHA Trophy more than once, winning it three consecutive seasons from 2000 to 2002). Prior to the final class Irish had won both individual open classes and the individual AQHA Trophy while placing third in team open reining (with Frevert winning individual beginner western, some though Black Hawk had a shot in the team competition, as their total number of blue ribbons across all western classes exceeded that of either Berry or Oregon State). Irish was not the only rider with time in the seat at 2011 IHSA Nationals prior to Team Open Western Horsemanship. Remarkably seven of the nine entries were exactly the same as the entries in team open reining two days earlier. The exceptions were Julianna Sovince of Oregon State making her only 2011 Nationals appearance in the final class and Katie Morehead of Findlay taking Wolf's place. The daughter of Cindy Morehead, Katie won the 2008 individual AQHA Trophy and had finished sixth in the division when the awards were present two classes earlier for the 2011 competition. 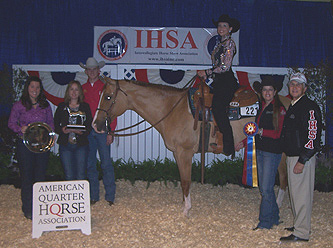 The third rider (after McGuire and Sintek of Oregon State) to compete in a western team class at every IHSA Nationals from 2008 to 2011, Morehead was looking for her first blue ribbon at an IHSA National show since winning team open western to close out 2009 Nationals. The class was like nearly all the others: Enter at a walk, then jog, then walk, then lope, then walk and line up to do the pattern one-by-one. Once all riders had navigated the cones Marash asked everyone to dismount and for handlers to come into the ring. After the handlers escourted the horses out of the ring for the final time during the 2010-11 IHSA season it was time for the results. Horner of the Cornhuskers was the first rider to hear her name while Eckert of the Racers moved up one place from her open reining effort, placing eighth. Like Eckert, Howland of the Mustangs went from an eighth to a seventh. Griffith of the Buckeyes was sixth, closing out the Ohio State scoring with a total of five points. 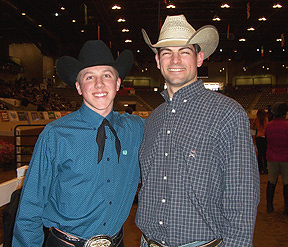 The highlight of 2011 Nationals for Austin Griffith was likely the individual open reining, during which he placed third to qualify for the NRHA Derby in Oklahoma City in June. Sovince, a senior from Eagle Creek, Oregon was fifth. With that announcement the Berry team could start "celebrating inside." The Vikings had clinched their first team IHSA National Championship of any kind. However it remained to be seen if Oregon State could hold onto second place. The red-hot Bekah Irish was still one of four riders standing in the ring. One of three teams to score at least one point in each of the six team classes, Berry College earned two firsts, three seconds and a third to win by a 33-23 margin over Oregon State. The Berry team (pictured) had taken full western and english teams to Nationals before, but in 2011 the Vikings prevailed over the entire field for the first time. Morehead finished her IHSA undergraduate career with a fourth. Findlay finished up with 15 points, but would this be good enough for fourth or fifth? Third place was a relief for the Oilers, as Romney was third. This gave Utah State 14 points and assured the Aggies of fifth place (14 points is Utah State's best-ever total at IHSA Nationals). Or did it assure the Aggies of fourth place? While it was a fact that Findlay would be a point ahead, it was unclear if there would be a tie for second, with both Irish and Jones still waiting for their ribbons. There would in fact be no ties among any of the nine western teams as Irish was the Reserve Champion. Had Irish won either of the team classes she would have taken Bowman and Cahill out of the record books as the first rider in IHSA Nationals history to win four open-level western classes at a National show including the individual AQHA Trophy (Ironically Bowman finished second to Erin Peery of Nebraska - Lincoln in team open western horsemanship at 2005 IHSA Nationals to miss out by a placing on that occasion). Like Sintek earlier in the day, Allie Jones of Berry had never won a class at three prior IHSA National shows. The senior originally from Cambridge, England took care of that by winning the class outright. With the win Berry scored 33 of a possible 42 points, giving the Vikings as many points as high point hunter seat team Centenary College had received a day earlier. However Berry earned 33 points over six divisions while Centenary did so over eight (Centenary was part of a field of 16 teams while Berry was in a field of nine - Editor). To underscore just how rare it is for a school other than Findlay or Ohio State to win this competition it should be noted that of all the other winners since 1991 (Texas A & M University four times, New Mexico State University twice, Colorado State University, Oklahoma State University and West Texas A & M University once each) only one of these schools is currently a member of the IHSA. West Texas A & M tied for the title in 2003 in Murfreesboro. Save for Colorado State, which simply dropped their team in 2005, the rest opted to go NCAA/Varsity-only in 2006. It should also be noted that all the teams which won an IHSA western championship prior to 1993 did so without reining, as the reining divisions were introduced during the 1992-93 season. With novice western introduced in 2003-04, Berry can claim to be one of only three current IHSA programs to have won high point western team honors at Nationals over the course of six different divisions. Berry College is one of only two current Zone 5 schools (the other being Murray State) to have ever won a western team championship, and the Vikings are the first program truly located in the Southeastern United States to accomplish this. 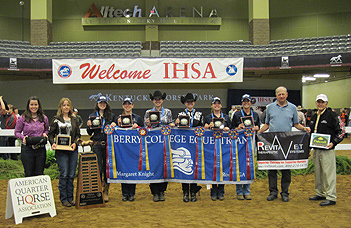 Head Coach Margaret Knight and her Berry Vikings broke through the status quo, leaving everyone to wonder if the 2012 IHSA Nationals western team competition will be just as unpredictable. AQHA Open Reining: 1. Andrew Wolf, University of Findlay. 2. Allie Jones, Berry College. 3. Bekah Irish, Black Hawk College. 4. Jason Romney, Utah State University. 5. Austin Griffith, Ohio State University. 6. Katelyn Lewis, Oregon State University. 7. Kelsey Horner, University of Nebraska at Lincoln. 8. Catherine Howland, Morrisville State College. 9. Samantha Eckert, Murray State University. AQHA Novice Western Horsemanship: 1. Andrea Smith, Berry College. 2. MaKena Lawrence, University of Findlay. 3. Dustin Renken, University of Nebraska at Lincoln. 4. Loren Witt, Murray State University. 5. Hayley McGuire, Oregon State University. 6. Marilyn Brandt, Black Hawk College. 7. Dianne Blocker, Utah State University. 8. Courtney Noonan, Ohio State University. 9. Christine Towne, Morrisville State College. AQHA Beginner Western Horsemanship: 1. Kathryn Sargent, Oregon State University. 2. Amy Cherry, Berry College. 3. Kelly Hunter, Morrisville State College. 4. Shelby Zerrusen, Black Hawk College. 5. Caitlin Sanders, Ohio State University. 6. Brizett Cole, University of Nebraska at Lincoln. 7. Lisa Yamane, Utah State University. 8. Jordan Hayes, Murray State University. 9. Elijah Darnall, University of Findlay. AQHA Advanced Western Horsemanship: 1. Kaci Sintek, Oregon State University. 2. Lauren Doyle, Utah State University. 3. Kristen Atwell, Berry College. 4. Katrina Quick, University of Nebraska at Lincoln. 5. Margaret Roberts, Morrisville State College. 6. Roxanne Clemens, Black Hawk College. 7. Claire Sutton, Ohio State University. 8. Madison Hallas, University of Findlay. 9. David Worley, Murray State University. AQHA Intermediate Western Horsemanship: 1. Paige Frevert, Black Hawk College. 2. Ariel Robelen, Berry College. 3. Katharine Du Mont, Oregon State University. 4. Andrea East, Murray State University. 5. Audrey Raby, Utah State University. 6. Tanya Ashford, Morrisville State College. 7. Sophia Browning, Ohio State University. 8. Kelley Black, University of Findlay. 9. Hannah Scow, University of Nebraska at Lincoln. AQHA Open Western Horsemanship: 1. Allie Jones, Berry College. 2. Bekah Irish, Black Hawk College. 3. Jason Romney, Utah State University. 4. Katie Morehead, University of Findlay. 5. Julianne Sovince, Oregon State University. 6. Austin Griffith, Ohio State University. 7. Catherine Howland, Morrisville State College. 8. Samantha Eckert, Murray State University. 9. Kelsey Horner, University of Nebraska at Lincoln.